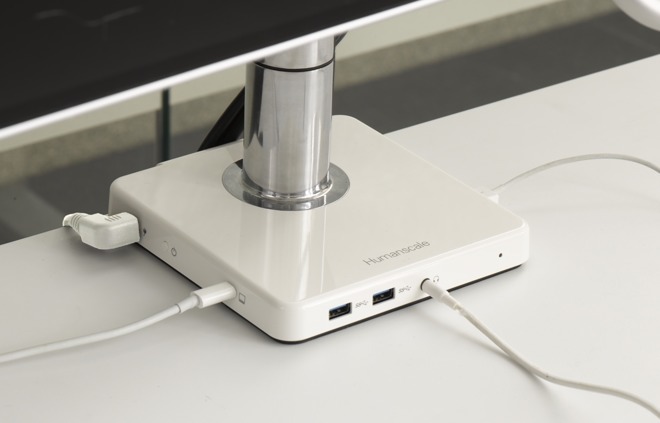 Ergonomic design firm Humanscale has updated one of its compact docks for the workplace, with the M/Connect 2 retaining the split docking station design while introducing USB-C charging and enabling the connection of higher-resolution monitors to the accessory. Following on from the original M/Connect, the M/Connect 2 divides the connectivity of the dock in half, with one part sitting on top of the desk offering essential connections, while the other half fits below the desk top. Pushing some of the ports below the desk allows users to hide some cables away from view, giving the appearance of a cleaner and uncluttered work surface. The dock itself appears to take up very little of the available space of the desk, with the low profile unit also acting as a support for the company's own range of monitor arms. When used with the display mounts, the dock looks as if it is a foot for the entire arm assembly, with the clamped dock taking the weight of the attached hardware. A total of seven USB 3.0 ports are included in the dock, with two included as 2.4-amp Quick Charge ports intended to provide power to compatible devices, such as the iPhone X and iPhone 8. Humanscale also notes that one of the Quick Charge USB ports only provide power to devices, and do not pass data to a connected computer, a feature to accommodate charging without compromising data security. The dock also has two USB-C ports, for different purposes. One is a full-feature USB 3.1 type C connection with up to 65 Watts of power delivery, used to connect the hub to a MacBook Pro for data and power, while the other is another power-only port used for charging USB-C devices. The dock also provides two video outputs, capable of supporting a pair of monitors with a 4K resolution, or a single 5K-resolution screen with displays that can use Multiple Stream Transport. This is offered through two DisplayPort 1.2 connections, which get their signal from the full USB-C port connected to the host. The top section also includes a combination headphone and microphone port that faces the user, for easier audio input and listening. Lastly, the lower section includes a Gigabit Ethernet port to connect the host computer to a wired network. Humanscale is currently shipping pre-launch orders, with new orders shipping from March onwards. The dock itself sells for around $300, depending on supplier, with the clamp and monitor arm sold separately. Add-ons range from $100 to $300, depending on the number of monitors and other factors.